That's an amazing tip, thanks! He ended up using these squirrels we had as ambient creatures as the animation timer, and they became the default timing mechanism. "Haha, no, we totally re-wrote the quest system for GD. Trying to make another game with the old TQ system would have been a nightmare and very limiting." I wonder though, whether this isn't exactly the issue with Ragnarok. We all know Ragnarok has its bugs, mostly quest related, and especially once you reach Valhöll. The delays seemed to be all messed up, and it apparently can't be patched. My guess is THQ Nordic didn't really know about the invisible squirrels, and used some other (inferior) mechanic instead. Yeah, lol, that artifact is there untill I can craft something else anyway. I should have the Crosier of Osiris available soon, then I hope to find Marduk's Tablet of Destiny or Lyre of Apollo, and if I can't get that: Morpheus' Dreamweb. Oh well, better luck tomorrow. Realised this character of mine didn't have a thread yet. The reason why is that really it doesn't need one. Just going with the flow, not following any strict build, it sailed through Epic. Now in Legendary it seems to need more time to kill mobs than my other characters, but on the other hand is incredibly sturdy. I just facetanked Legendary Polyphemus. The stats look terrible, but stats are actually quite useless on this build; because it get some much of its damage from debuffs and Psionic Touch's staged trigger, and has a lot of life leech, the offensive as well as the defensive stats give no reliable impression of this character's performance at all. I was going for this skillpoint distribution, with a basic 3:2 Strength:Dexterity ratio. However, I have recently been discussing going full hybrid with @botebote77 . Considering how much electrical burn damage and vitality damage this build puts out, even as a side effect, it should benefit immensely from some investment in Intelligence. I'd say the cut-off point would be something like 440 Strength for Hades' Aspis, and 316 Dexterity for the Sword of Covu, which in turn would leave you at around 382 Intelligence, also because the rather large amount of Intelligence you get from both masteries. It'd probably mean I could also max out Distort Reality, and Temporal Rift too, instead of one-pointing them. The downsides are I wouldn't be able to equip that Abyssal Plate I found casually on a Laconian Satyr (lol! ), and that 316 Dexterity might result in too little OA/DA for a weapon using build. It looks just perfect for this build! Anniversary Edition - General discussion / Re: Best TQ Vault? General Discussion / Re: Artifact Completion Bonusses,.. imbalanced? cheating is something you do to make things easy for you right? xmax is the opposite..
3x Legendary Typhon makes the game more difficult for sure, but there are also a lot of areas where it doesn't make the slightest bit of difference whether you're facing 5 trash mobs or 15, and we all know the best loot drops from Bonepiles and Satyrs. So, XMax does making farming a fair bit easier. If it's containers you want, then there's also 3x Megalesios, which is not too hard. I'm not saying Xmax is cheating, I'm just saying that the statement that anything that let's you do something the game doesn't allow you to do, or let's you do something the game only allows you to do in a roundabout way, is cheating, while simultaneously running Xmax, doesn't make any sense to me. Now, I understand how people may find that completion bonus system flawed and unfair, since many bonuses are generally useless. For example, who is crafting Blood of Ares for a mediocre poison DoT? I guess this is the grindy part of TQ. Every ARPG needs one. PoE has six-linking. GD also has his set of artefacts. TQ also allready has it completely ridiculous set system. Think about it: art-wise the Theban Set is probably the game's most iconic gear, yet no character is ever going to wear the full set. It's a five piece level 10 set after all, by the time you've got it completed, you'll have several characters at level 40+ at least, which much better gear available, even for newly made characters. Are we expected to endlessly farm Normal Nessus on our first character? In fact, by the time the set is completed, even that character will be overlevelled, just from farming. Now, there's nothing to be done about that, but it also goes a long way for artifacts. Legendary artifacts require greater artifacts, that require lesser artifacts; it's not uncommon to need about seven recipes plus relics and charms to craft a single legendary artifact. Some legendary artifacts require even more recipes. If you add completion bonusses to that, ot does not just become grindy to craft the same legendary artifact over and over again,.. it becomes pretty darn impossible. This is precisely why I feel the completion bonus system is not working as intended. It's a bonus, it should be something extra, that just adds something the player doesn't really need. Yet, the "bonus" is such a major feature on some items, that it can make or break the quality of the item. 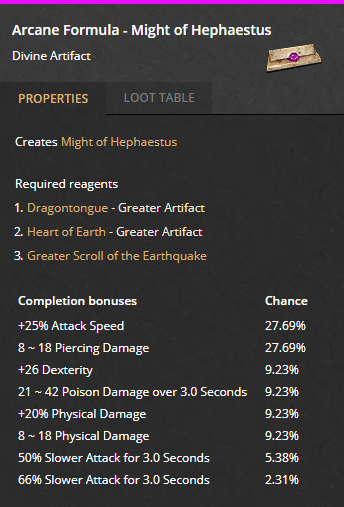 To have mediocre Poison DoT on Blood of Ares, where you actually have a better chance of getting +20% Physical Damage or +25% Attack Speed, does not make the game challenging or grindy, it is simply pure horse piss, and sure as hell can't be considered a "bonus". 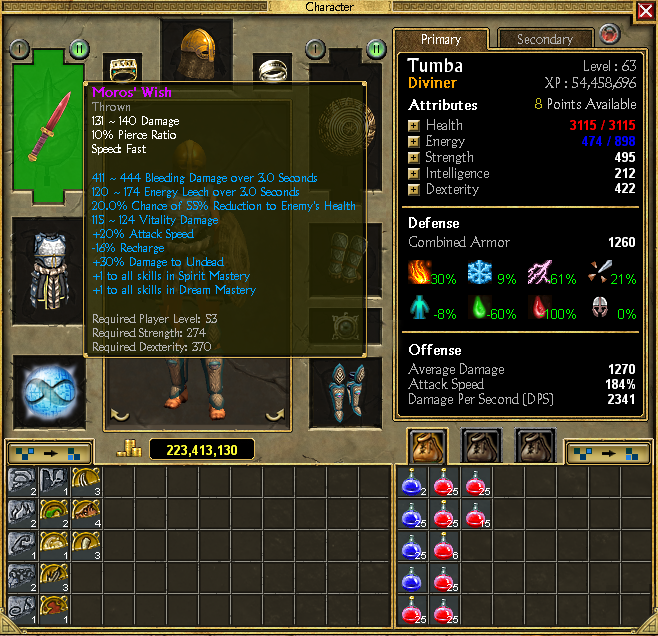 Then finally there's the point that where set item droprates are as they are, the game does actually allow you to tamper with completion bonusses, by reloading an earlier save, similar to how it allows you to store more items like the Vault, by creating mules. If you consider this to be cheating, fine, but then please be consistent: no X-max mod either. Well, it makes sense; the damage is quite insane, so if it would be under no-cooldown LMB it would be way overpowered for melee characters. but you probably are dual wielding thrown weapons, right? cap is 141% attack speed? that's very easy to reach.. primal magma alone gives 35% attack speed.. but why Might of Hephaestus? aren't there better artifacts? i mean it's good but you won't benefit from iron fist because it's melee only right? Hmmm,.. I only found that out after creating it, but luckily I had my savefile backed up. I think I'll be better of crafting the Wheel of Taranis for now, and saving my Dragontongue and Heart of Earth, untill I find a recipe for the Eye of Ra. It's still odd though how much better some Completion Bonusses are compared to others. Is there a tool to modify/choose/reroll Completion Bonusses? It save the hassle of savegame manipulation. General Discussion / Artifact Completion Bonusses,.. imbalanced? and I got it with the +20% Physical Damage modifier, which isn't too bad, since it's a hybrid, and increased Physical Damage will benefit Elemental damage as well, after conversion. I can't help but wondering though whether the +25% Attack Speed wouldn't be better, and I've wondered that a lot of times with a lot of artifacts. The +25% Attack Speed modifier seems to always trump all, at least for weapon users, since it benefits all damage types and conversions simultaneously. Is there a point where the other modifiers become more worthwhile? I think it has to do with generating sooo much ice at 300% casting speed, that some of the frost effects bleed out, affecting the caster. With his core temperature thus lowered, the caster needs some time for his feet to thaw, before he can start running again. It's like how theoretically at the speed of light mass becomes infinite: at 300% casting speed the temperature reaches absolute zero. This is why it only happens at 300%, whereas at 299% there is no noticeable impact. What does stand out in your video is that your Menhir Wall looks a lot bigger than mine, both in heigth as well as in width. Does the size of the stones actually increase with the number of points invested in it? You mean throwing weapons, or do you actually mean as a Magician using throwing knives? One could say that with the limitted range one might still just as well go melee, but Thunder Strike works differently for melee, and by differently I mean vastly inferior to the 10 projectiles you get from dual wielding throwing weapons. Hmmm,.. looks good for a melee. I might have put less points in things like Magical Charge and Rune Weapon for now, in favour of one pointing Seal of Fate and the likes. However, you'll want to max out all of these eventually, so as long as you're getting by, it makes no difference for now. My only real comment would be that I would not put more than one point in Heat Shield, as the damage resistance and duration do not increase, while the damage absorption only applies to fire damage, the energy cost does increase, and the damage retaliation, on a non specialised retaliation build, is meagre, even at 12 points. The main point is that as a Stonespeaker, you should have no problem getting your fire resistance to very acceptable levels at the least, even without Heat Shield or Stone Skin.